Background and Objectives: The dental caries status of a population group with permanent dentition is traditionally described using decayed, missing, and filled teeth or surface (DMFT or DMFS) index, and the corresponding index for the primary dentition is dmft or dmfs. dmf value alone has certain limitations; therefore, additional measures to describe dental caries are important. Poulsen and Horowitz in 1997 described a hierarchical method to determine the severity of dental caries. Aim of the Study: The aim of the study was to determine the pattern of dental caries in 3–6-year-old children using Poulsen and Horowitz hierarchical system and to assess the usefulness of this system. Methodology: Data were collected from 500, 3–6-year-old children. Dmfs was recorded according to World Health Organization criteria 2013. On the basis of the caries recordings, the dmfs score of each child was calculated and each child was assigned to one of the six zones of increasing caries severity, ranging from 0 (caries free) to 5 (most severe). Statistical Analysis Used: The collected data were tabulated and analyzed using Student's t-test, ANOVA, and Pearson's correlation coefficient. Results: The overall mean dmfs for the study population was 9.10. The distribution of children according to the severity zones of Poulsen and Horowitz indicates a very low percentage (17.8%) of caries-free children and also a high percentage of children with caries in severity zone 2 (33.4%) and 4 (18.6%). Conclusion: The Poulsen and Horowitz model gives broader aspect for the assessment of severity of dental caries in 3–6-year-old children. Background: The oral health imparts a major impact on one's quality of life. Since last decades, there is an increase in the prevalence of dental afflictions which can be avoided by the knowledge of simple preventive measures. Aim: The aim of this study was to assess the oral health status of children and to analyze its association with the education level of their parents. Materials and Methods: Two randomly schools were selected and all the children from 5–15 years willing to participate in the present cross-sectional study were assessed for oral health status using the World Health Organization for the oral health awareness in children, 2004. Both child and parents were directly interviewed to avoid any bias in understanding the questionnaire. Statistical Package for the Social Sciences (16.0) was used for data analysis. Chi-square/Fisher's exact test was used to compare the dichotomous variables. Results: A total of 210 (133 males and 77 females) children were assessed along with their parents for the awareness of child's oral health condition. Totally 134 (63.3%) children were of age group 5–10 years, while 76 (36.7%) children were of age group 11–15 years. Children with uneducated parents have often experienced toothache, brushes once a daily and frequently visits the dentist for toothache compared to children of educated parents, and this association was observed to be statistically significant (<0.001). Conclusion: The oral health status of children was average. However, education level and awareness of parents regarding oral health preventive measures play a key role in determining the oral health of children. 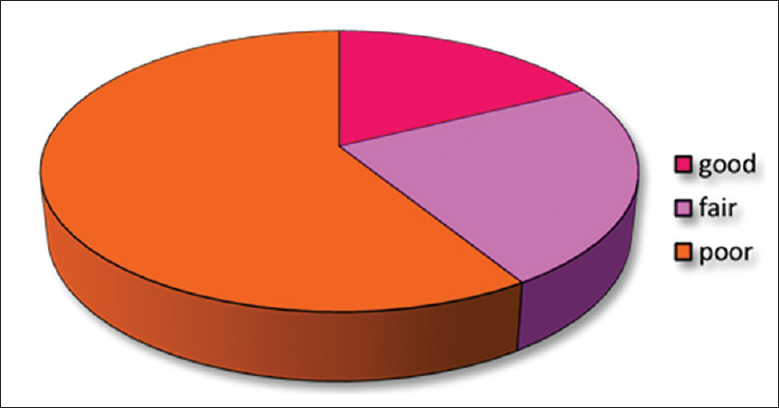 Aims: This study aimed to document the prevalence of oral manifestations seen among pediatric gastroesophageal reflux disease (GERD) patients in Chennai, Tamil Nadu, India. Methodology: This study was performed at various children's hospitals in Chennai. Fifty-one GERD patients who were assessed by endoscopy and 24 h pH-metry, 31 (60.78%) males and 20 (39.21%) females, aged 2–12 years (mean age, 7.43 years), comprised the study group. All patients answered a detailed frequency questionnaire related to regurgitation and acidic foods and participated in a clinical dental examination. Statistical Analysis Used: Data were analyzed using the SPSS statistical software package version 19. Results: Among the GERD patients, 42 (82.35%) had dental erosion. A total of 668 (57.98%) deciduous teeth and 484 (42.02%) permanent teeth were examined, of which dental erosion was detected in 248 (21.52%) and 171 (14.84%) teeth, respectively. The most commonly affected primary tooth was the occlusal surface of the maxillary posteriors and commonly affected permanent tooth was occlusal surface of the mandibular molars. Conclusions: There may be a positive correlation between GERD and dental erosion. According to this study, presence of erosion, especially in posterior teeth, could be a key to diagnose GERD and refer the child to the gastroenterologist. Background: The efficacy of dental treatment on the levels of inflammatory markers in ventricular septal defect (VSD) has not been fully explored. Aims: The aim of this study was to assess the level of salivary interleukin-6 (IL-6) in children with early childhood caries (ECC) and VSD and to compare its levels before and after comprehensive full mouth rehabilitation. Methods: Saliva samples were collected from children with ECC and VSD before dental treatment and 1-month posttreatment. 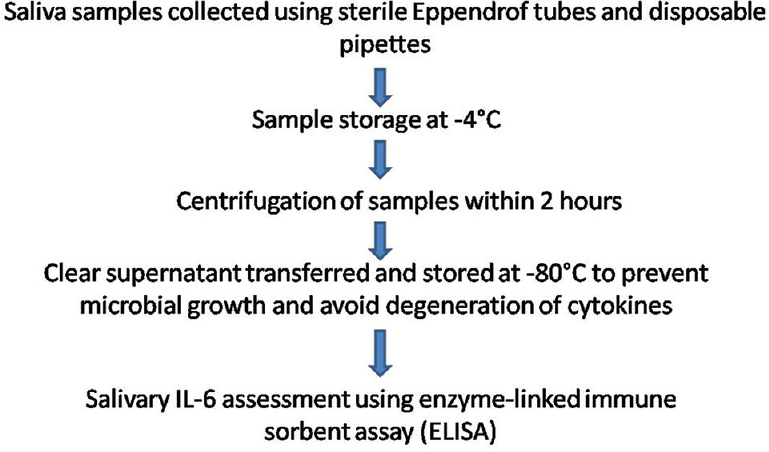 The salivary IL-6 levels were analyzed using the enzyme-linked immunosorbent assay method. 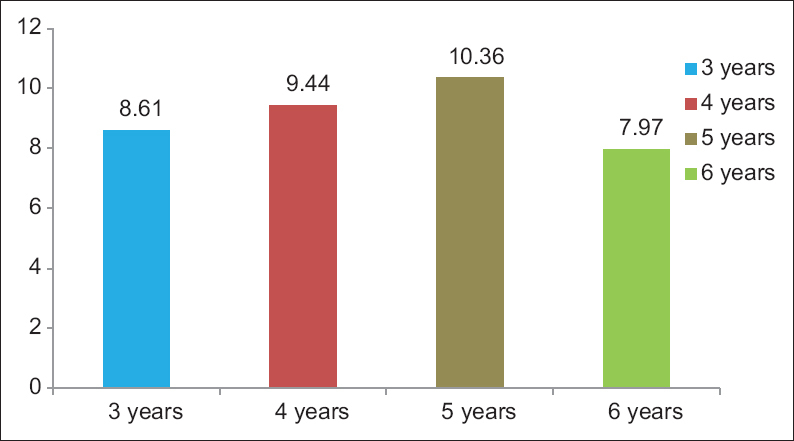 Gingival index (GI) was also timely recorded during the study period. Oral health awareness sessions were conducted for children and their parents. The Fisher's Least Significant Difference test was used for intergroup comparison of salivary IL-6 levels, while the paired t-test compared the values of GI before and after treatment. Results: The mean salivary IL-6 levels 1 month after treatment had reduced (P < 0.000). There was a reduction in GI score (P = 0.002). Conclusions: When children having VSD and ECC are dentally rehabilitated and followed up periodically, the level of IL-6 is minimized, hence improving the quality of life of the affected children. Objective: The aim was to assess the effects of crude extract of whole apple on the cariogenic properties of Streptococcus mutans by evaluating (1) its growth, (2) its adherence property, and (3) changes caused by acid produced by S. mutans in the presence of sucrose (in vitro). Study Design: Kashmiri Apples (sourced from the local market) were used for the study. Whole apple extracts including the skin were used to obtain undiluted crude apple extract. The growth of S. mutans in the presence of the crude apple extract was evaluated by agar diffusion test as well as direct contact inhibition test. The effects of the crude extract on the adherence of S. mutans was assessed by modified O'Toole method in which the viable cell counts of S. mutans which remained adherent on the microtitre plate were calculated. The effects of the test materials on pH changes caused by S. mutans in the presence of sucrose were assessed using pH meter. Results: Crude extract of the whole apple showed no significant inhibitory effect on the growth of S. mutans while a significant inhibitory activity on the adherence of S. mutans was observed. Furthermore, the significant inhibitory effect on the pH drop was recorded, although pH remained below the critical value of 5.5 at all times. Conclusion: Crude whole apple extract has considerable anti-cariogenic effect on S. mutans and hence can be used as a natural alternative which can aid in the prevention of dental caries. Aim and Background: The aim of the present study is to evaluate and compare the antimicrobial susceptibility and cytotoxicity of Cocos nucifera and chlorhexidine (CHX) as irrigating solutions against Enterococcus faecalis, Prevotella intermedia, and Porphyromonas gingivalis. Materials and Methods: The ethanolic extract of husk of C. nucifera was prepared. The minimum inhibitory concentration (MIC) and minimum bactericidal concentration (MBC) of the extract were determined using the serial broth dilution method and its cytotoxicity was evaluated against human periodontal fibroblasts using 3-(4,5-dimethyl-thiazole-2-yl)-2,5-diphenyl tetrazolium bromide assay. 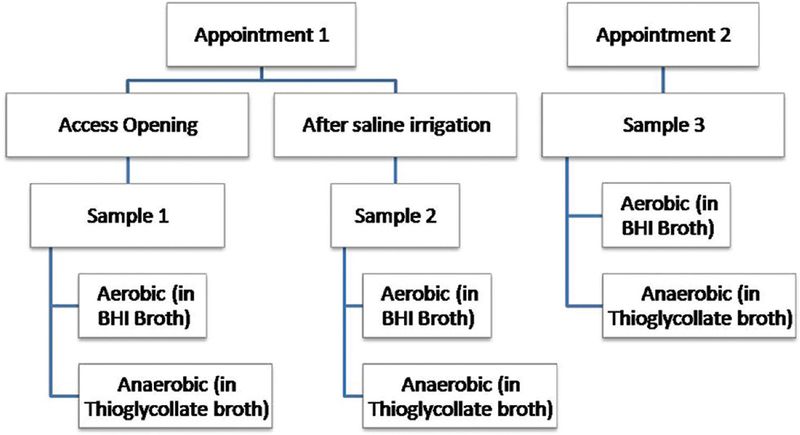 Antibacterial susceptibility for two irrigating solutions, namely 2% CHX gluconate irrigant (Group I) and 1.5% C. nucifera husk irrigant (Group II), was tested against P. gingivalis, P. intermedia, and E. faecalis. Results: The MIC and MBC of C. nucifera husk extract for P. gingivalis were 468.75 μg/ml and 1562.5 μg/ml, for P. intermedia were 48.8 μg/ml and 1875 μg/ml, and for E. faecalis were 1562.5 μg/ml and 3750 μg/ml, respectively. The extract was nontoxic to the human periodontal fibroblast. Both the materials have shown similar antibacterial susceptibility and no difference was observed at baseline, 10, 30, and 60 min using two-way repeated measures of ANOVA. However, a statistically significant difference was observed between different time points for P. gingivalis and P. intermedia using Bonferroni multiple comparison test (f = 826.1390, P ≤ 0.05). Conclusion: 1.5% of ethanolic husk extract of C. nucifera has a significant antibacterial action against polymicrobial dental biofilm and its activity is comparable to that of 2% CHX which validates its use as a future irrigating solution for overcoming bacterial resistance with synthetic agents. Objective: The objective of the study was to study root canal morphology of primary molars by clearing technique and to observe for any variations. Materials and Methods: One hundred and twenty extracted primary molars were divided into four groups (n = 30); Group I = maxillary first, Group II = maxillary second, Group III = mandibular first, and Group IV = mandibular second. The samples were subjected to decalcification, clearing, and dye penetration. The data regarding the root canal morphology of each sample were tabulated based on the number of root canals, curvature of the root canal, and root canal configuration. Descriptive statistics were applied. Results: According to Vertucci's root canal configuration in Group I, mesiobuccal root exhibited 93.10% Type I, 6.90% Type II, and 6.90% Type IV; distobuccal root had 95.65% Type I and 4.35% Type IV; and palatal roots had 100% Type I canal configuration. In Group II, mesiobuccal root showed 90% Type I and 10% Type IV; distobuccal root had 100% Type I; palatal root exhibited 96.30% Type I and 3.70% Type III. In Group III, mesial root showed 20% Type I, 6.67% Type III, and 73.33% Type IV and distal root had 76.67% Type I and 23.33% Type IV. In Group IV, mesial root exhibited 100% Type IV and distal root had 43.33% Type I and 65.67% Type IV canal anatomy. Conclusion: Vertucci's Type I root canal configurations were most frequently observed. Background: Organic amine fluorides and nano-hydroxyapatite dentifrices have shown remineralization potential in various studies. However, there is a lack of direct comparison between amine fluoride and nano-hydroxyapatite with conventional inorganic fluorides as sodium monofluorophosphate. Aim: The aim of the study is to evaluate remineralizing efficacy of the three dentifrices on both primary and permanent enamel surfaces. 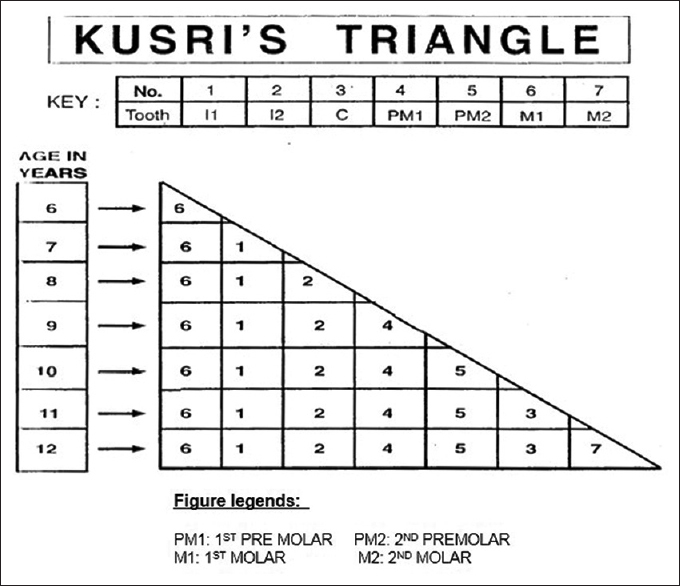 Methods: Enamel sections were obtained from 40 sound molars – 20 primary and 20 permanent molars. Five enamel slabs were prepared from these extracted molars stored in artificial saliva, wherein one slab acted as control, second as demineralized (negative control), and other three slabs were brushed with sodium monofluorophosphate, amine fluoride, and nano-hydroxyapatite dentifrices, respectively, twice daily for 21 days. Scanning electron microscopy- Energy dispersive spectroscopy (SEM-EDS) analysis for surface morphology and calcium and phosphorus content and Vickers surface microhardness (SMH) values were evaluated at baseline, after demineralization, and postapplication of the experimental agents. Results: Highly significant changes in calcium phosphorus ratio and SMH values were seen in enamel slabs treated with nano-hydroxyapatite and amine fluoride dentifrice as compared to sodium monofluorophosphate in both primary and permanent teeth. Surface morphology of enamel slabs treated with amine fluoride most closely resembled natural enamel morphology, while sodium monofluorophosphate-treated surfaces showed globular pattern of remineralization. Deposition of a separate highly mineralized layer over existing surface was seen in nano-hydroxyapatite-treated surfaces. 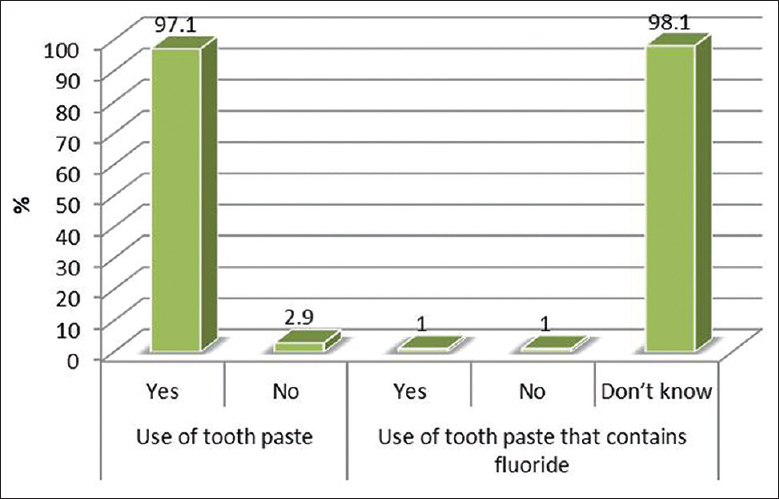 Conclusions: Nano-hydroxyapatite exhibited highest remineralization potential in terms of mineral gain followed by amine fluoride and sodium monofluorophosphate dentifrice. Background: Child presents a unique challenge to accept a dental treatment, and such a challenge gets modified by the presence or the absence of a parent in the operatory. Many dentists have reportedly and controversially used parental separation anxiety as a tool to control behavior of an uncooperative child and also to deliver quality dental treatment in young children. But is the parental separation beneficial for dentist to gain child cooperation? Aims and Objectives: The objective is to evaluate the influence of parental presence or absence in the operating room on child's behavior during dental procedure on children of 4 years and above. Materials and Methods: The study was carried out on 30 children of 4–7 years of age group, 16 (4–6 years) preschoolers, and 14 (6–7 years) early schoolers. Two consecutive restorative procedures were carried out. On a first visit, parents were present and on a second visit, separation of parents was done. Behavior rating was done by commonly used Frankel's Behavior Rating Scale. Results: Chi-square test was performed for the statistical analysis. There was no significant difference found in the child's behavior by the presence or absence of parents in the perception of dental treatment in the dental operatory. In contrast to that there was a significant increase in cooperative behavior of some children due to other factors influencing the behavior of the child with a Chi-square value = 35.296, P < 0.001. Conclusion: Parents can be excluded from the dental operatory to eliminate many behavior-related problems during the course of treatment. 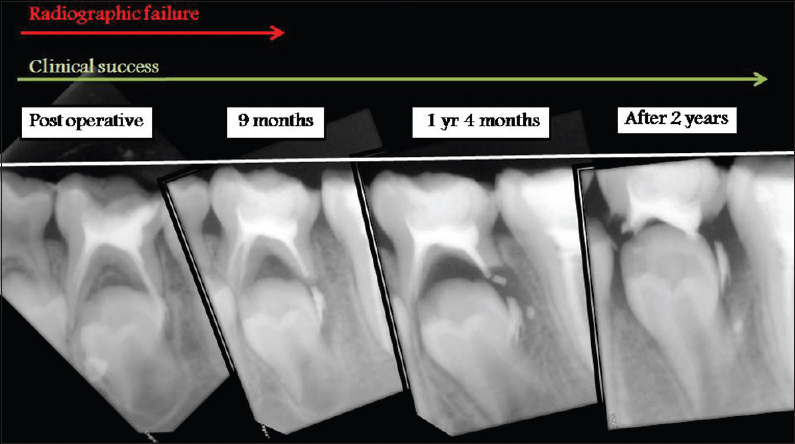 Context: Despite modern advancement in material and technical aspect, management of infected primary molars is of prime concern in pediatric endodontics. An effective root canal material plays the major role in achieving the fluid impervious seal by defending against variant microflora and maintaining the tooth in function for longer duration. Aims: This study aims to evaluate and compare the success of endoflas as root canal filling material in infected primary molars with zinc oxide eugenol (ZOE). Materials and Methods: Primary molars with necrotic pulp in healthy, cooperative children were selected. Ethical clearance and informed consent was obtained. Standardized pulpectomy procedure was done and root canals were filled with either ZOE or endoflas. Further follow-up with clinical and radiographic evaluation was carried at 0, 3, 6, 12, and 24 months. The findings obtained were statistically analyzed using Chi-square test. Results: Endoflas showed acceptable results as root canal filling material in primary molars even at 2-year follow-up, though overfilling of root canals led to low success rate compared to teeth with combined optimal and under fillings. There was no significant difference between the two materials (P > 0.05). Conclusions: Endoflas could be a potential alternative to ZOE for preserving infected primary molars. Background: Anxiety control has been one of the key factors that shows that success of a pediatric dental practice. Animal- Aassisted therapy has shown to have many health benefits, which has brought the animal species closer to our homes with an establishment of a relationship. Aims and Objectives: The purpose of this study was to compare a Anxiety levels of patients scheduled to visit a Private private Ppediatric dDental Hhealth- Ccare Ffacility in Chennai and Ccompare the levels when exposed to animal-assisted activityAAA at the waiting area and in the oOperating area. 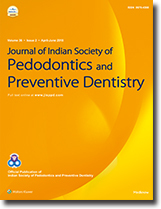 This study being a first of its kind in the Dental dental Environment environment consisted of 20 children (9 Malemales, 11 Femalefemales), aged 4-–11 years, attending a private dental care facility in Chennai. Results: Results showed that a 15- min exposure in the waiting area has reduced the level of anxiety and also showed no increase in anxiety among the subjectsparticipants. Conclusion: Thus, Pet pet Ttherapy has shown to be a promising method of Anxiety anxiety control, a key to a successful dental practice. Background: Age estimation methods in the permanent dentition are numerous in number and well established and evaluated. However, there exists a dearth of methods available for the estimation of age based on the eruption status of primary teeth, despite various studies displaying greater accuracy using such methods. Aim: The purpose of this study was to develop the methods of age estimation based on the eruption status of primary teeth and based on previous methods developed for permanent teeth and to assess the accuracy of the methods in a clinical situation. Materials and Methods: A total of 50 children were randomly selected between the age group of 6 and 38 months for the assessment of primary tooth emergence in the oral cavity. New methods of age estimation (triangles and regression equations) were developed for used in the Indian population. Results: Data were analyzed using receiver operating characteristics curve and intraclass correlation coefficient. Our results conducted in a validation sample of 30 children suggested high levels of accuracy using the new methods, with greater accuracy displayed using the regressive equation (0.928) as compared to the new triangle of age estimation (0.897). Conclusion: Such methods of age estimation will be of unparalleled importance in rural setups, which cannot afford the luxury of panoramic radiography. Objectives: To evaluate the aerobic and anaerobic antimicrobial efficacy of Ocimum Sanctum (Tulsi) essential oil and compare it with that of triple antibiotic paste (TAP) by collecting microbiological samples from the root canals of primary molars. Study Design: Forty children were selected for the study and were randomly divided into two groups of twenty each, namely, TAP group and O. sanctum group (basil). Six intracanal samples were collected for every patient, comprising of two each after access opening, irrigation and after 3 days of intracanal medicament placement. These samples were cultured in aerobic and anaerobic environment and later colony-forming units (CFUs) were counted and intragroup as well as intergroup comparison was done. Results: Analysis of the results showed that there was a statistically significant reduction in CFUs after using essential oil of O. sanctum as an intracanal medicament. Saline use also leads to a statistically significant reduction in CFUs irrespective of the intracanal medicament used. TAP showed better antibiotic properties in comparison with that of O. sanctum. Conclusion: Antibiotic use is often associated with the adverse effects and development of resistance due to injudicious use. O. sanctum can be used in cases of long-standing infection owing to its antimicrobial efficacy and anti-inflammatory potential as an intracanal medicament in primary teeth. Background: With the increasing patient demands of esthetics in paediatric dentistry, pre-veneered stainless steel crowns (SSCs) have been made available commercially. However, they suffer from technique sensitivity, limited ability to crimp and associated higher costs. Aim: The present study was planned to clinically evaluate and compare the success of preformed SSCs in which esthetic modification was done using three different techniques of composite veneering. 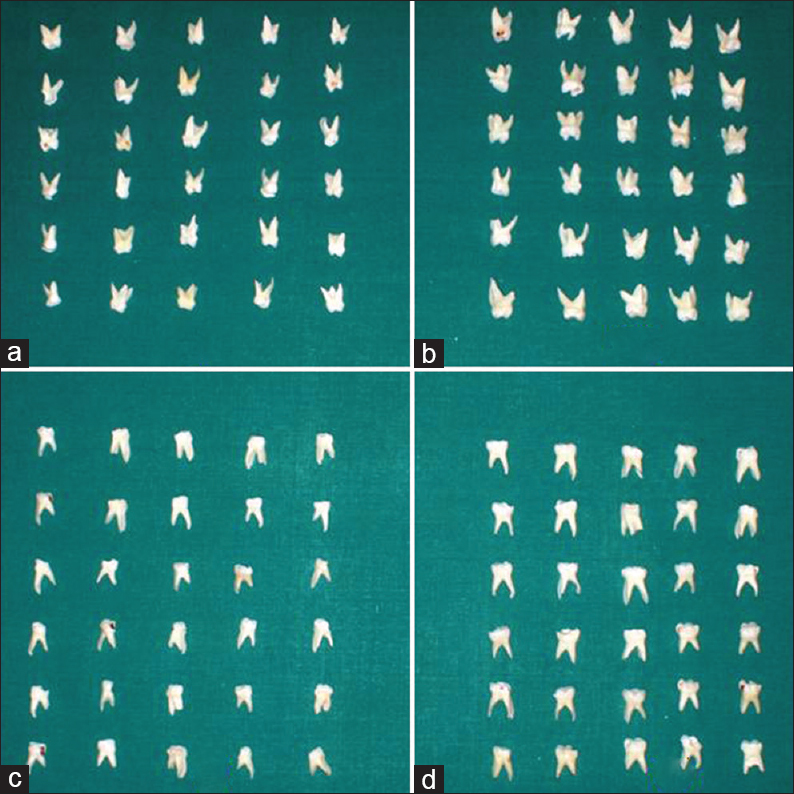 Materials and Methods: A total of 60 primary molars selected from patients between the age group of 4–9 years were randomly divided into three groups having 20 samples each: Group A (composite veneering done using the open face technique), Group B (composite veneering done after sand-blasting SSCs), and Group C (composite veneering done after preparing retentive grooves on SSCs). 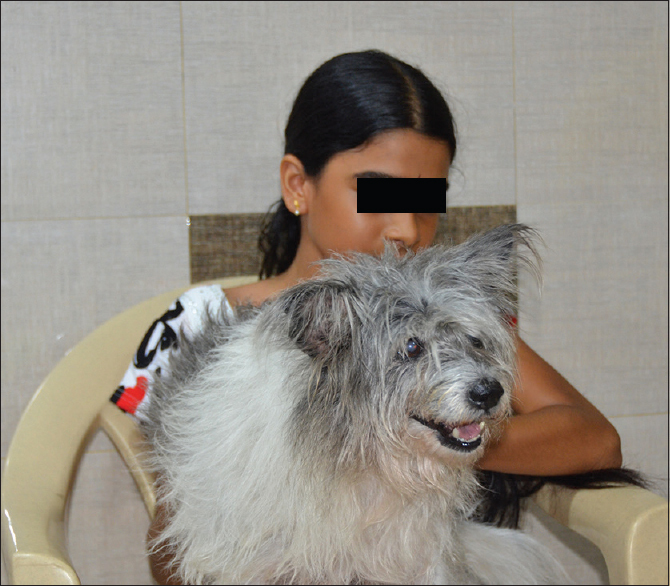 The patients were evaluated at 1, 3, 6, and 9 months as per evaluation criteria. Statistical Analysis: Kruskal–Wallis and ANOVA were used to compare means among three groups at different time intervals. Results: All 60 SSCs were retained at the end of the study, thereby demonstrating 100% success of SSCs. Open window technique of veneering significantly showed maximum retention of composite veneers; therefore, highest level of parental satisfaction. Overall, the most common fracture was of adhesive type seen at the metal composite interface. Conclusions: All the three techniques used provide a chairside and easy method for esthetic modification of the SSCs. The open window is the most successful of the three methods of veneering and may be clinically useful technique for dental practitioners and pediatric dentists. Aims: The aim of the present work was to evaluate the dentoskeletal effects of swallowing occlusal contact intercept appliance (SOCIA) III in pseudo Class III malocclusion treatment. 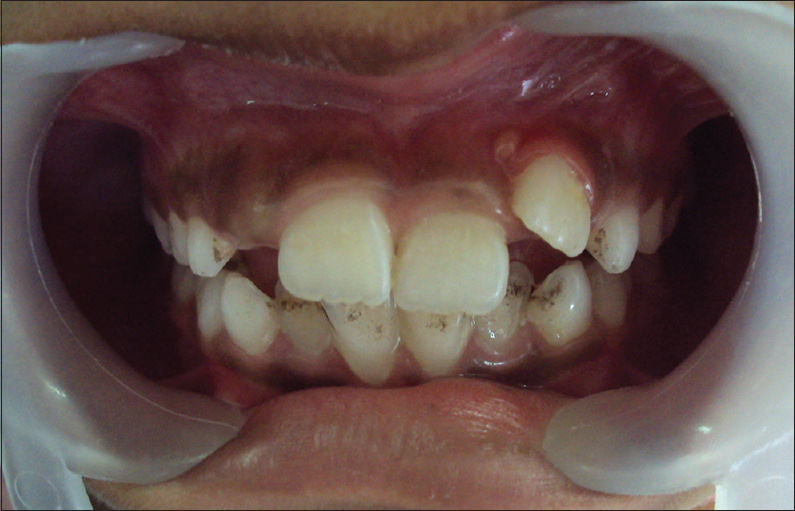 Materials and Methods: Thirty-six patients (mean age: 9.46 years old) with pseudo-Class III malocclusion and 22 pseudo-Class III untreated controls (mean age: 8.7 years old) were selected and examined. All patients presented with a cervical stage CS2, CS3, or CS4. Patients with CS5 were not enrolled in the study. Cephalometric analysis was performed before phase 1 treatment (T1) and immediately following phase 2 treatment (T2). Statistical Analysis: Paired t-test and independent t-test. Results: SOCIA III had skeletal and dental effects. The main effects of SOCIA III were on the midface with an effective increase of the sagittal growth (cranial base P < 0.001, anterior cranial base (ACB) P < 0.001, and maxilla growth P < 0.001) and vertical growth (anterior facial height P < 0.001). 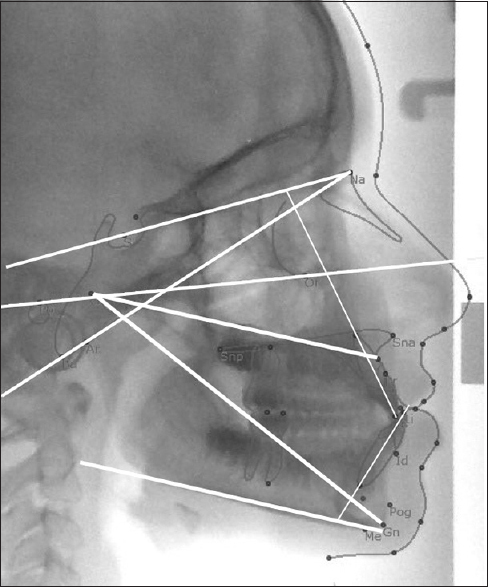 The effects of SOCIA on the mandible were a control of mandibular postrotation (P = 0.82) and the sagittal growth (P < 0.007). At the end of the treatment, a normal overjet was achieved (P < 0.001). 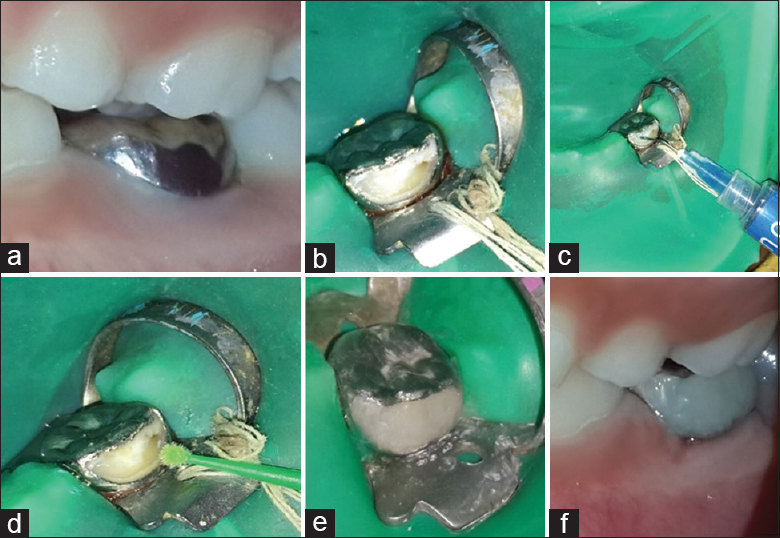 Conclusions: The SOCIA III effects are resumed as follow: (a) an effective maxillary sagittal increase on the sagittal plane; (b) a vertical mandibular control; (c) a resolution of overjet; (d) no increase of overbite; (e) a stimulation of ACB growth. Dentine Dysplasia is a rare genetic condition. The treatment options and dilemmas associated with the condition remain undiscovered so far. This article highlights the variations in traits and challenges faced in the treatment of the cases. Trauma and infection to immature teeth can result in a number of complications. Discontinuity in the formation of root is one such complication which has never been documented before. 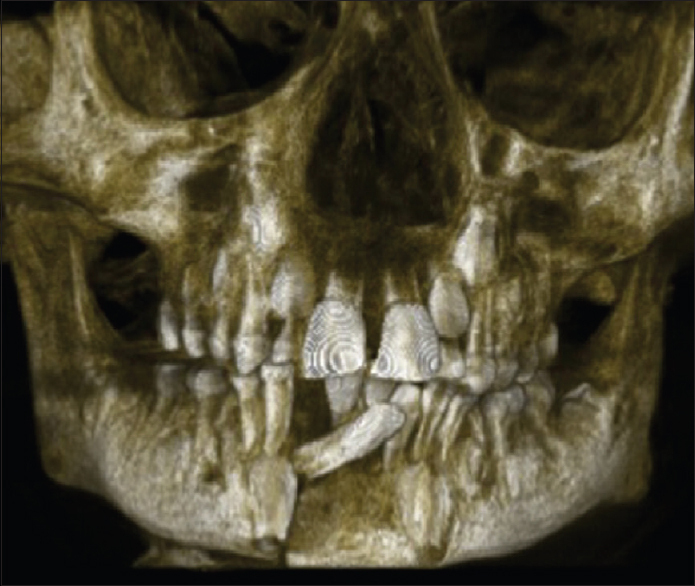 In the following article, a case report of this aberrancy which was observed in the root of a permanent central incisor, subsequent to a traumatic injury is discussed. In spite of this discontinuity, complete root formation and vital pulp were noted in the tooth. Since such a case has not been reported in literature till date, this complication is described and the possible cause of its occurrence is discussed in this article. 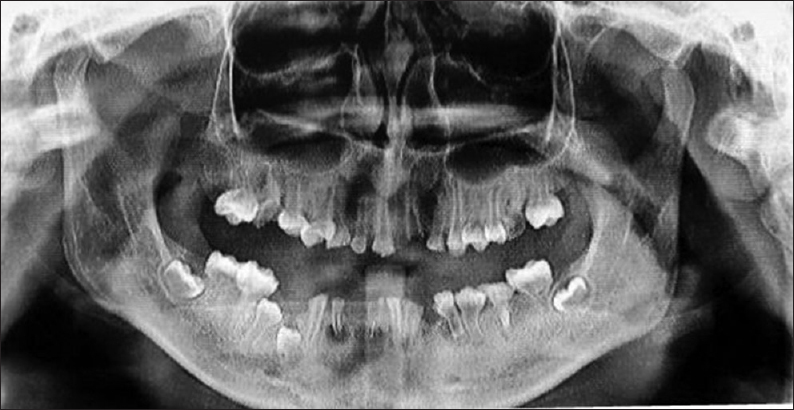 Mandible is one of the commonly fractured bone in children during maxillofacial trauma. These factures are usually managed conservatively but sometimes require open reduction and internal fixation (ORIF). Management of mandibular fracture in children is influenced by the presence of developing permanent tooth buds, minimal anchorage from primary teeth and facial growth and development. Although, there have been technical and material advancements with ORIF, it is still associated with complications related to growth and damage to developing teeth. This case report describes a case of mandibular parasymphyseal fracture managed successfully with open reduction and internal fixation using a miniplate and a consequent cessation of root growth and eruption failure of a mandibular canine present in the fixation area.